Looking for a food-friendly white wine for the summer months ahead? 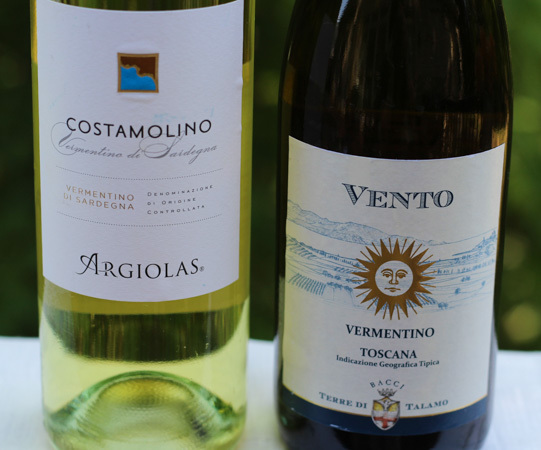 If your usual summer choices are Pinot Grigio or Sauvignon Blanc, try Vermentino! Vermentino, in general, has more complexity than Pinot Grigio and not the bracing acidity and grassy notes often found in Sauvignon Blanc. Vermentino is produced in a number of different countries and styles. 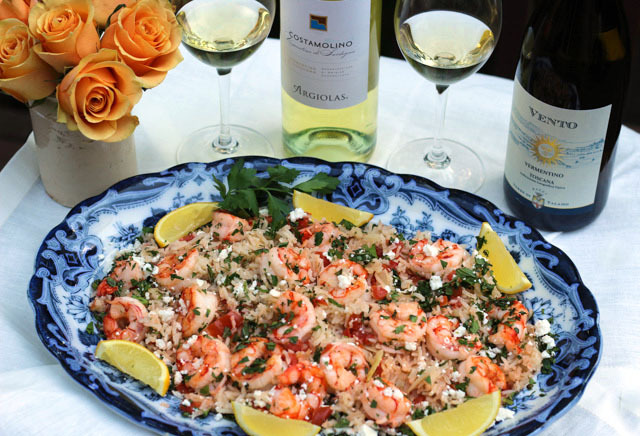 Which Vermentino to pair with shrimp and fresh herb pilaf? Start with Vermentino from Italy. Light to medium body, dry, fresh medium+ acidity to a richer fuller style when the wine has undergone malolactic fermentation (a secondary fermentation that changes the tart malic acid to creamier lactic acid). Flavors can range from and include; citrus, mineral notes, salinity, green apple, herbs, melon, tropical fruit, and almond. 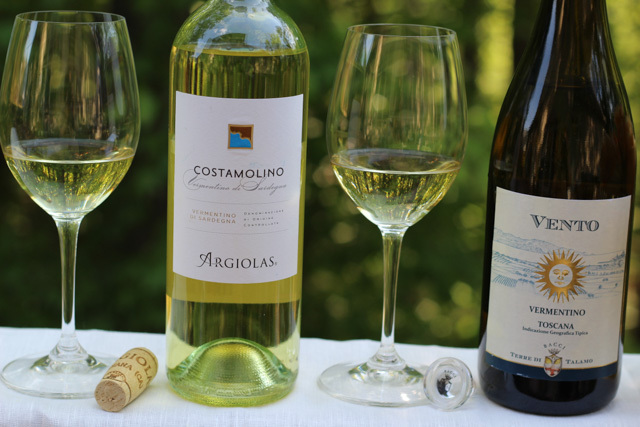 Vermentino wines that are lighter in style with crisp acidity will pair well with fresh, clean, and simple flavors; light appetizers, seafood, grilled fish, and risotto. For richer style Vermentino (Gallura and Corsica), poultry, pork and, veal work well as pairings. Cheeses to try with Vermentino; Burrata, goat cheese, Havarti, and Feta. Produced on the island of Sardinia. Founded by Antonio Argiolas in 1938. The Argiolas family is recognized as Sardinia’s leading wine producer. Grapes are harvested in August and September and vinified in stainless-steel tanks. A small percentage underwent malolactic fermentation. Pale straw in color with a green hue. Medium acidity and body. A soft round texture on the palate with notes of citrus, herbs, stone fruit, and almond. The vineyards are located in Tuscany. The winery is owned by Bacci Wines. Grapes are harvested in September and vinified in stainless steel tanks. Pale straw in color. An aromatic nose of citrus blossoms. On the palate, medium juicy acidity with a medium body. A rich mouthfeel with lingering citrus notes. Both Vermentinos that I tasted, though from different regions in Italy, were similar in style and paired beautifully with the shrimp and fresh herb pilaf. The slight sweetness in the shrimp brought out the fruit component in the wines. The herbs and citrus elements in the wines were echoed in the food. The fresh, clean simplicity of the dish did not overwhelm the flavors in the wine. It was a food and wine pairing in perfect balance. Rinse rice in a strainer until the water runs clear. In a large sauté pan over medium high heat, add 3 tablespoons of oil olive. After a few minutes, add fennel and onions sauté until soft but not colored. Add the garlic and Piment d' Espelette, continue to sauté for another 2 minutes, and then add tomatoes. Sauté for another 2 minutes. Add the rice and stir to combine. Pour in the vermouth, bring to a boil and reduce liquid by half. Add chicken broth and bring to a boil. Reduce heat to low and simmer until rice is tender and the liquid is absorbed about 20 minutes. About 10 minutes before rice is done, in a large sauté pan over medium-high heat add the remaining 3 tablespoons of olive oil. After a few minutes, add the shrimp and sauté until pink and cooked through on both sides (you may need to do this in two batches). Season with salt and pepper. Gently mix the herbs into the rice. 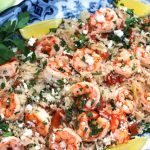 To serve, spoon rice on to a large platter, arrange the shrimp over the rice and sprinkle with the crumbled feta cheese. Add lemon wedges to squeeze lemon juice over the rice and shrimp. Learn more about Vermentino from my fellow Italian Food, Wine, & Travel bloggers and their blog posts listed below. And join our conversation on Twitter Saturday, May 5th at 11:00am ET following the hashtag #ItalianFWT. Cheers! A perfect dish for spring – and two very enjoyable wines to accompany it! Beautiful photos, too. Looks like the perfect scenario for a relaxing lunch with a couple of good friends. Loving that recipe and I’m sure it was a great pairing. This combo is right up my alley. 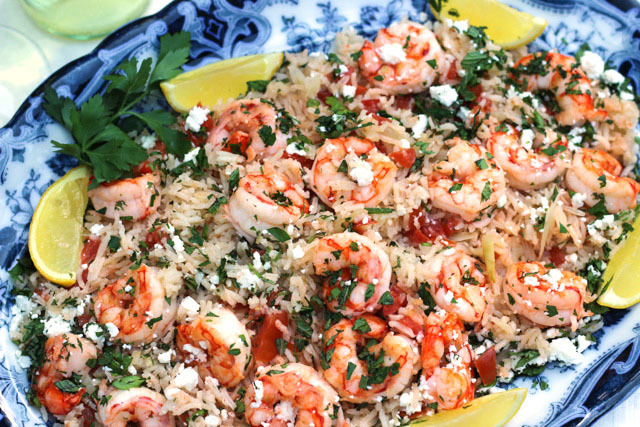 The shrimp and pilaf look really fantastic! Your blog is just so beautiful – so inviting! I really want to try a Vermentino from Sardegna – mine was from Toscana and I’d love to sample the pair you have here. I love your pairing. I can totally imagine those flavors with the wine. Great recipe! I want to make that shrimp dish just because it is so pretty! Nice food styling and wine pairing too! Two good wines…and the pairing seems great. How did you…or rather did you feel the difference in structure and body? Other differences/similarities? I was expecting more of a difference between the two wines, but honestly they were more similar then different. I think the Costamolino having a portion go through malolactic fermentation contributed to the richer mouth feel, a characteristic I also noted on the Terre di Talamo Vento. Mediterranean type food goes so well with wine of the same- fabulous looking dish. Glad to see Vermentino being grown in many places. Wouldn’t it be fun to get one from each area, invite the #italianfwt gang and taste through them?! ?